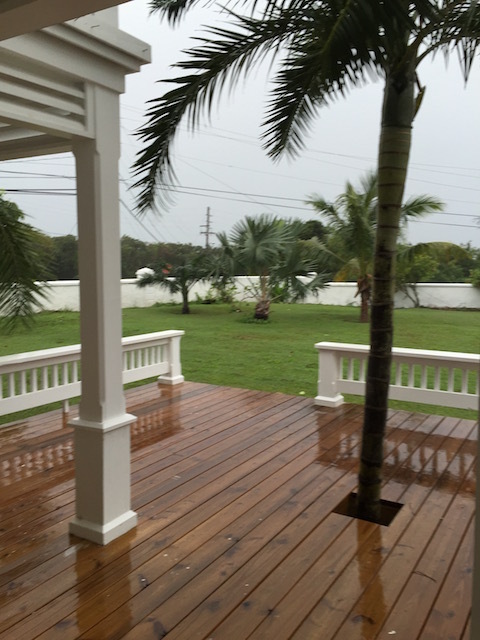 At the time of writing this we are experiencing a cold front here in Governors Harbour. Strong winds and heavy rain – the sort of rain that comes in horizontally and will find any gap it can to seep through and flood into your house in unexpected places ! Temperatures are much lower than normal and the wind whips around – maybe we are experiencing wind chill …. I know this is all pretty relative when much of the northern hemisphere is going through proper winter weather but of course we are not really equipped to handle colder weather very well. Wet and windy – soup weather ! So of course my thoughts turn to comfort food. I love home made soup and there is nothing like a lovely bowl of steaming chicken and sweetcorn soup to warm everything including the heart ! This particular soup holds great memories for me. I first used to make it around 35 years ago for the two stepsons I had way back then. They were never particularly enthusiastic about it as I remember – but when I met up with one of them around 9 years ago just after his father had died in an accident I was shocked an amazed to hear that he – now a keen cook himself – made it regularly for his own family – and talked about how it reminded them of me and how I had looked after them !!! 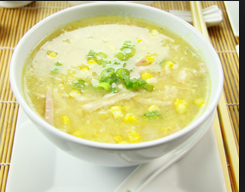 And all that time I had been convinced that I had ruined their lives by not being the best of stepmothers …..
Chicken and sweetcorn soup – yes please….. I think that favorite foods from throughout our personal history are a good way of remembering and holding dear to us the people who for one reason or another are no longer in our lives – certainly me for me it keeps memories of people in a tender place in my heart whenever I eat foods I associate with them. Anyway back to the chicken and sweetcorn soup. The basis of a lot of my cooking is around homemade chicken stock. Whenever I roast a chicken I always boil up the carcass with onions carrots and celery to make a good and tasty stock. Bob simply hates the smell of a boiling stockpot – so if he is around I just bung it all in a bag in the freezer and wait until he is out before adding the water and simmering it for a couple of hours. At the stove – my favorite occupation ! So to make the soup gently sweat some finely chopped onions in butter just until they are translucent. Add plenty of finely diced potato – this is how I thicken the soup – along with a little garlic and ginger and allow that to cook gently for about 10 minutes. Finely chop the chicken and set to one side along with a couple of cans of sweetcorn which have been drained. Add the chicken stock to the onions and potatoes and simmer gently for about 20 minutes. Blitz the mixture either with a hand held stick blender or in a blender – securely hanging on to the lid…… Put back into the saucepan – add the chicken and sweetcorn and gently warm through. Taste and season at this stage – the stock can be quite salty sometimes so don’t just add salt willy nilly – you need to taste, adjust, taste and adjust. Sometimes I add a little Worcestershire sauce – but not too much as it can be overpowering……. I love a big steaming bowl of this served with hot buttered toast – my favorite is the cheese topped bread from Banks Road Deli– just what the doctor ordered ! As I said – cold front and warm tummy ! This picture has nothing to do with the blog at all !! However it was in the pictures I downloaded to go in the piece and it just reminded me how totally irresistible this little boy was – I took it while we were marooned in Nassau airport for 7 hours last week ! Do you think one of those backpacks would suit me ? I love this blog! Memories of my grandfather are always flavored with the great meals he made from scratch; and how he had a sweet tooth (even when there were so few left!) and had to have cake or fruit cocktail for Sunday dessert. 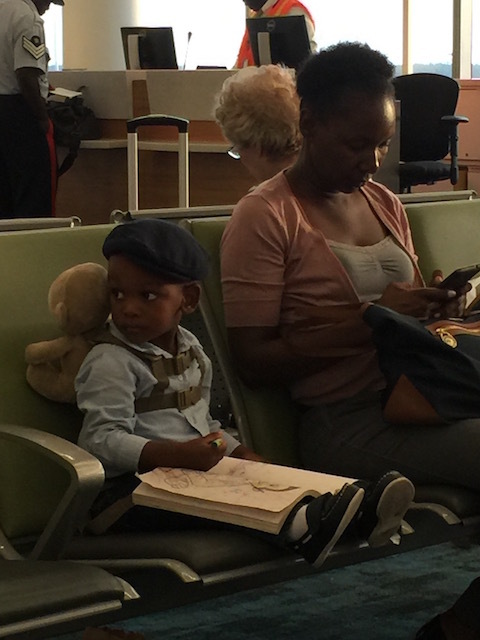 The icing on this blog was the picture at the airport; there’s nothing more adorable than a well dressed child with a book on his lap! Thanks Sherelle – this is exactly the sort of memory jogger that I wanted to invoke – perfect….. Fruit cocktails after Sunday lunch were a big thing in our house as well ! The little boy was so well behaved and doing his coloring beautifully – I was totally besotted. Love your blog! And having stayed in one of your homes; I would have a lot more fun cooking this soup in one of your kitchens than mine! Thanks so much – I remember – you stayed at Tops last November. Happy New Year Kim and come back soon – not just to cook the soup ! Golly! I laughed and grimaced when you mentioned Bob’s dislike of the oinon smell in the home. Mom was and I am allergic to onions and that saturation in the air is well – Bob knows! I can enjoy them elsewhere when sautéd to transparency with a little sugar…otherwise your recipe sounds delicious. Certainly soup weather up here in western Massachusetts. Your cold front is out of place! Great parting shot…BTW do you have puck lights in the event electricity goes out at night?